The Aspen High School girls ski team celebrates on the podium after winning the state championship on Friday in Leadville. It is the Skiers eighth state title in school history, and first since 2016. 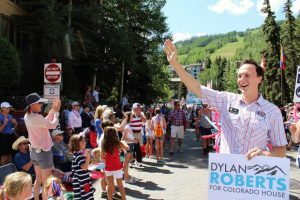 According to Aspen High School junior Reed Beidleman, hosting the state skiing championships at Ski Cooper near Leadville literally leveled the playing field. The Skiers overcame the early surprise and made the most of it down the stretch, sweeping both the boys and girls state titles on Thursday and Friday. It is the eighth state championship for both the AHS boys and girls in school history. The girls last won in 2016, while the boys last title came in 2014. Both teams took third at the state meet in 2017, held in Steamboat Springs. 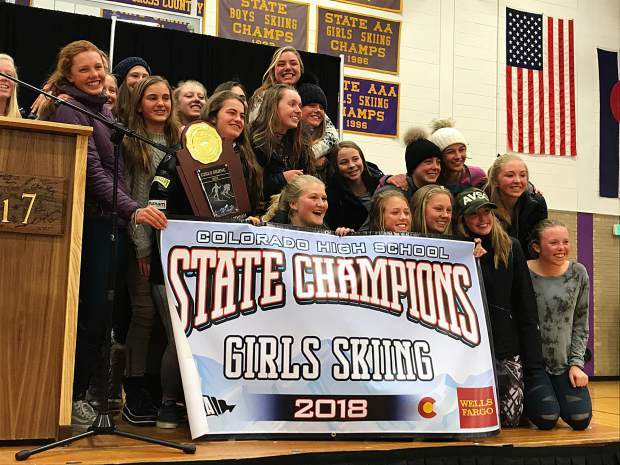 The AHS girls swept the board, scoring the most points in both slalom and giant slalom, as well as in both Nordic races (the classic race was a tie with Vail Mountain). In the end, the Skiers finished with 650.5 points to win the girls title, while Battle Mountain took second (581), Vail Mountain third (540), Steamboat Springs fourth (533) and Summit County fifth (520). Aspen only had one individual race winner from the two-day state championship, and that was senior Chelsea Moore. The future Dartmouth athlete won Thursday’s Nordic classic race, edging out Colorado Rocky Mountain School’s Kate Oldham. Oldham won the skate race on Friday, while Moore was third. McSwain led the AHS girls alpine team, taking second in the giant slalom and third in the slalom. Junior Levyn Thomas was third for Aspen in the GS, while freshman Edie Sherlock was eighth for Aspen in the slalom. The Aspen boys finished with 661.5 points, followed by Vail Mountain’s 572, Battle Mountain’s 563.5, Middle Park’s 557.5 and Steamboat’s 549.5. Senior Everett Olson carried the AHS Nordic boys, taking second in the classic and second in the skate. Aspen freshman Noah Forman was third in the slalom while Beidleman was fourth. AHS senior Heath Colon was fourth in the GS, junior Ethan DeMoraes sixth and Beidleman 11th. Also of note, Aspen’s Henry Barth was named the skimeister at the state championship, making him the top athlete to compete in both alpine and Nordic events.